The 70 million figure is for this year, according to several Nikkei sources. The claim was backed up by IHS Markit analyst David Hsieh, who added that Samsung could deliver as many as 95 million panels if Apple needs them. Regardless of order size, some panels could be for iPhones going into manufacturing this year but only selling in 2018, once again depending on demand. In February a South Korean report claimed that Apple had entered into a $4.3 billion contract with Samsung for 60 million OLED panels. It could be that Apple has decided to increase numbers as part of a more optimistic forecast. 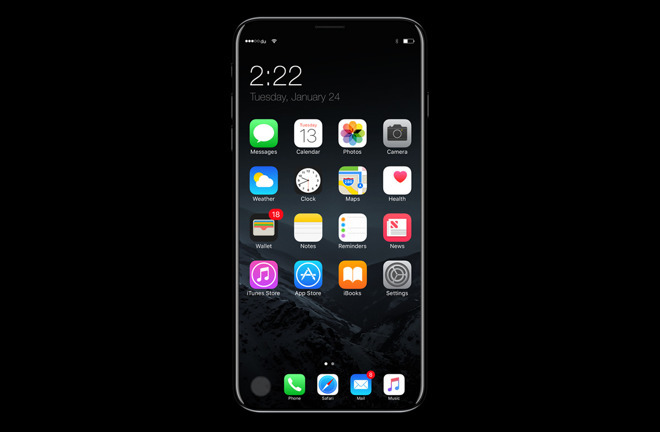 One Nikkei source reiterated claims that the "iPhone 8" will feature wireless charging and 3D facial recognition, in addition to replacing a physical home button with a virtual one. The device should also be waterproof like the iPhone 7, possibly upgrading to an IP68 rating. Apple is also expected to offer two LCD-based models sized at 4.7 and 5.5 inches, sharing wireless charging and waterproofing in common but retaining a physical home button. Nikkei suggested that the OLED phone will feature a 5.2-inch display, but that differs with most reports pointing to a 5.8-inch panel. The disparity could be linked to claims elsewhere that virtual buttons will take up about 0.7 inches.